Happy Monday for another week! Before I start this post I just want to say a huge thank you to everyone who's visited my blog, stopped to read a post or two, and liked my Facebook page. Thanks to this post, some of my blogging goals have been reached a lot sooner than I'd expected, which is exciting. So thank you all. xo. Mary Mary, quite contrary, how do your gorgeous prints grow? Seriously, look at how detailed and exquisite her garments are. Mary Katrantzou is originally from Athens, Greece and she traveled all the way to Rhode Island's School of Design to complete her degree. She followed this up with the completion of her Masters at Central Saint Martins. Mary's signature design encompasses "a hyperrealist aesthetic, bold graphics and industrial jewellery." She further notes that the woman who fits her brand has a liberated spirit and a strong sense of style. Her garments certainly reflect this strong sense of style, with extremely tailored pieces, often featuring bold, Victorian style print. The girl wearing these clothes has to have a strong sense of confidence in how she dresses. Obviously she won't be afraid by bold, beautiful prints either! 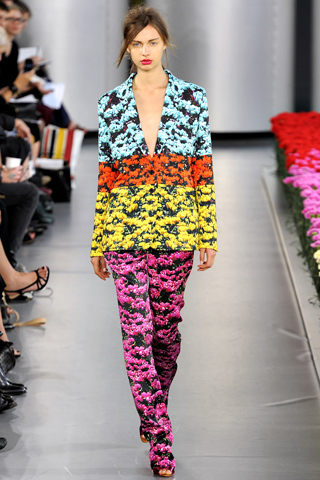 For more Mary Katrantzou keep an eye out for her new website launching soon. In the meantime you can admire her works over on her Facebook page. -Runway Photos care of style.com. -TopShop & Street Style images via We Heart It. Absolutely love prints this season. Just snagged myself a vintage floral jacket from Trademe, so excited for it to get here! !